Microsoft Small Basic is intended to be fun to use. It is that, and more besides. It has a great potential as a way of flinging together quick and cheerful applications, just like those happy days of childhood. Tetris anyone? It is a brave Microsoft employee that can stand up and say ‘I have a design for a new computer language. I think I shall call it BASIC’. This seems to be just about what a software developer in the Oslo team, Vijaye Raji, did. Having had the idea, and some encouragement, he created the first prototype of Small Basic as a ‘side project’ in his spare time. Thankfully for us, he was supported and assisted by many Microsoft people who understood what he was aiming for. The result is a language that is extremely compelling; What is more, it is fun to use. Already, there is a strong community of users who exchange programs and give advice to newcomers, and Vijaye is active on its forums. So what is Small Basic? Small Basic is a development environment, and compiler, for the rest of us. Unlike PowerShell, it is immediately accessible, and just begs you to try programming in it. Unlike PowerShell, you cannot yet use it for many serious applications. It has some novel ideas, not least of them being able to publish, rate, or access Small Basic programs on the web with a couple of clicks. There is also a Silverlight player for Small Basic programs that enables you to run Small Basic programs on your browser without having to install the IDE, so you can even embed programs or games on a blog or website! As a result of the simple way that you can publish programs, there is a growing collection of sample code, and by looking at it and maybe tinkering you can pick the language up in a matter of hours. When you feel that you’ve outgrown the language, you can just hit the ‘graduate’ button, and your program is converted to Visual Basic. Small Basic started out with the observation that youngsters no longer programmed for fun. Unlike the generation who bought Apples and TRS 80s, BBC Micros and a host of other cheap computers with little on them but a basic interpreter, today’s kids now prefer to play with games. Who wouldn’t? The downside to this is that there is now a generation in the West that is leaving school without the programming skills that the previous generation gained tinkering with primitive microcomputers. Vijaye, and some others in the Oslo team such as Chris Anderson, felt that there was nothing in the .NET framework that was geared towards children and beginners. There certainly wasn’t much that normal humanity would think of as fun in the framework. The sheer complexity of Visual Basic and Visual Studio was too intimidating for beginners, and also for people who just wanted to get something done, but weren’t professional programmers. The introduction of F# and PowerShell confirmed the deeply cerebral thinking of Microsoft. There is nothing as exciting for .NET as Java’s OpenProcessing; nothing that one could just use for making strange patterns or wild animations. Vijaye’s idea was for a simple compiled language that had the same simplicity and appeal of the old Quick basic of MSDOS, but with objects, a simplified grammar, and a sandboxed functionality. Vijaye wanted to escape from the trend for continual abstraction in languages that beginners find confusing, leaving just an operational abstraction that allows you to call methods on, for example a ‘Flickr’ object. Vijaye put together a prototype in his own spare time that took its inspiration from the old QBasic, where the BASIC manual was little more than one-page. This time, however, there had to be enough graphics support to allow games to be written, and even Turtle Graphics. The result is similar in its theme and intention to the brilliant Logo interpreter put together by Gary Kildall for CP/M around 20 years ago: a language that is ideal for the beginner and fun to use. One can certainly achieve something cool with 25 lines of code. What makes Small Basic so attractive is that the application is ultimately Vijaye’s vision and idea. He makes the ultimate decision on what is included and what is kept out. The result is the antithesis of the design-by-committee of much of Microsoft’s output. We can be thankful that Vijaye’s vision is sound, and fits in with what Niklaus Wirth, Charles ‘Chuck’ Moore and other great language designers have been saying. ‘Keep it simple, get things up and running quickly’. The dialect is called Basic, but it is Basic without the oddities. Small Basic is typeless. It is imperative and doesn’t use or expose beginners to concepts like scopes, types or object orientation. It consists of just fifteen keywords, including GoTo. 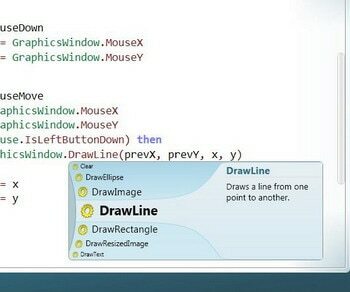 Vijaye wrote a simple IDE for it with intellisense and help. It can consume .NET objects. As it is provided, it has just a few simple built-in objects that are chosen to provide various interesting effects and to show the possibilities, but any number of static objects can be created in C# to add to it. All variables are global, and scoping is avoided entirely. There are subroutines, but no other types of routine. Small Basic cannot pass arguments to subroutines and cannot return values from subroutines (no functions). Subroutines can be triggered by events: You can create a subroutine and assign it to an event. This will wire it up to the event. Keywords are case-insensitive. It is a protected sandbox of the .Net libraries. You can, of course, write extensions for particular purposes. The standard libraries provide static “Objects” that group operations, properties and events. New libraries can be created using other .Net Languages and plugged in to extend the possibilities of what you can do from within Small Basic. Some third-party plug-ins already exist. As it stands, it is powerful enough to allow you to write a space-invaders, Tetris, Sudoku or Pong game in around 25 lines. A little application to display photographs from flickr takes three lines; an application to change your desktop screensaver can be done in two. You could argue that there are better ways of doing it but the fact remains that this is a quick and pleasurable way. Sure, you learn bad habits, such as the GoTo keyword, but when you see better ways of doing things, the experience will allow you to understand why they’re better. You’ll see that it is pretty simple to use. Key in your code, and hit F5. 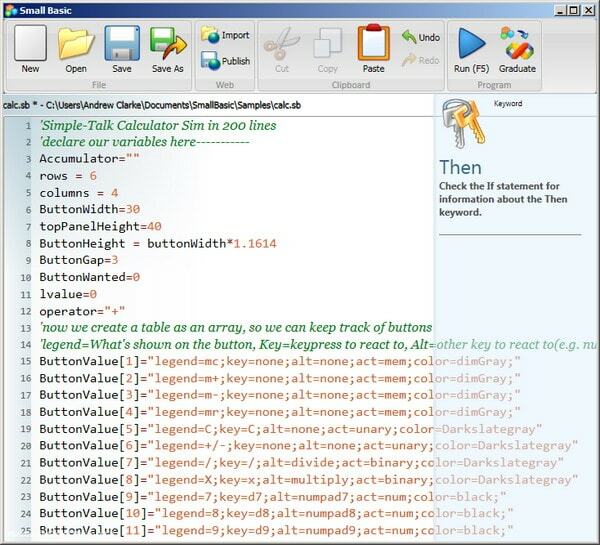 Right-click the code for a context menu that allows you to format code. Line numbers are added so that you can see easily where the compiler hit a problem (you can of course, click on the message to go straight there). There is intellisense too that pops up when you start typing. Because variables are all global, it will serve these up too along with the keywords and objects. It would be nice to say that one can use it without looking at the API documentation which is available from Microsoft, but I’m old enough to find this handy to refer to. You can see the result of pressing the ‘import’ icon. Just type in SNG664, and the program can be downloaded ready for you to run and maybe change and improve. I’ve also put it here, in case you just want to see the code. It is really simple to get results. In seven minutes, I typed this program that gets a definition of a word from an online source. You’ll see that you’ve actually created an EXE file, an assembly. It is just 3K in size. As long as you have the SmallBasicLibrary.DLL in the GAC, or a copy in the directory you store your application, you can run the exe file from anywhere without needing the IDE. You have created a very simple way of automating routine processes. There is a pretty reasonable file-handling object with enough clout to do useful tasks such as arranging backups by date and retiring aged backups. You can download, and save, files from the internet. Because you can get web pages by URL, it is possible to get or send (in the query string) information to or from the internet. Your assembly dll should be in Small Basic’s ‘lib’ directory in a folder named “lib” in the Small Basic’s install location. You can optionally provide XMLDocs that will be picked up by Small Basic’s intellisense. Vijaye provides a sample extension to get you started. 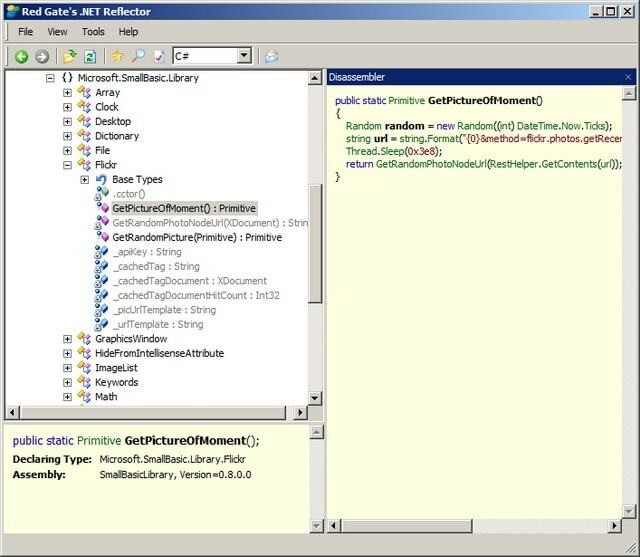 Using .NET Reflector, you can also see how vijaye implements the built-in objects. If you have Reflector Pro, you could even debug his code to see how it works! OK. So what is stopping you integrating quite complex libraries into Small Basic, in order to use it to automate processes? Hmm. The first thing I’d want to integrate would be a good Regex search, using the excellent .NET libraries. Then I could compile up all my common search/replace tasks. So What’s wrong with Small Basic? Well, considering that a single person wrote it, it is superb. However, it still has a few rough edges. It isn’t entirely stable yet, it doesn’t auto-save, and the IDE seems to be missing some basics such as a way to close edit windows from the menu or move between them. There is no ‘Replace’ function and Intellisense stops short of prompting you for parameters to methods. Small Basic itself seems to have absolutely no error handling. As the dialect is incapable of rendering numeric text in a bounded box properly since there being no left, right or center alignment, there are clearly some essentials missing. I have a few niggles, that aren’t really huge problems. I’d like a complete solution for serializing arrays for import, export or initialization. It is there in a primitive form, but only for simple arrays with just one dimension (attribute=value;attribute=value; attribute=value; etc…) whereas something closer to XML or JSON would be nice. If I say that this brings the fun back to programming, is this a valid reason to recommend it? Yes, because it was designed and intended to be fun. I think Small Basic needs a small amount of tidying up before it is fully released as V1. However, it has great potential as a first language for anyone, whatever age, particularly where they want to exchange applications easily. As it is so extensible, it could also quickly be brought to bear on tasks where a certain amount of automation has to be provided, but where PowerShell is just too much like Klingon. It has a completely different use as a way of embedding simple graphical applications into internet sites. I can see it being used, with extensions, as a tool for automating and monitoring processes. You can always graduate to Visual Basic and the overweight Visual Studio if your brain is just too big for Vijaye’s cute IDE. Why would one enjoy programming in Small Basic? I think that part of the reason for this is the work that has gone into making it easy to exchange programs, and share things with an active community, and the challenge of working with a restricted set of features. It is also a great way of adding features to a website that are difficult to achieve any other way. This is a very useful extension to Small Basic by Francois Remy, with a range of useful for .NET integration. 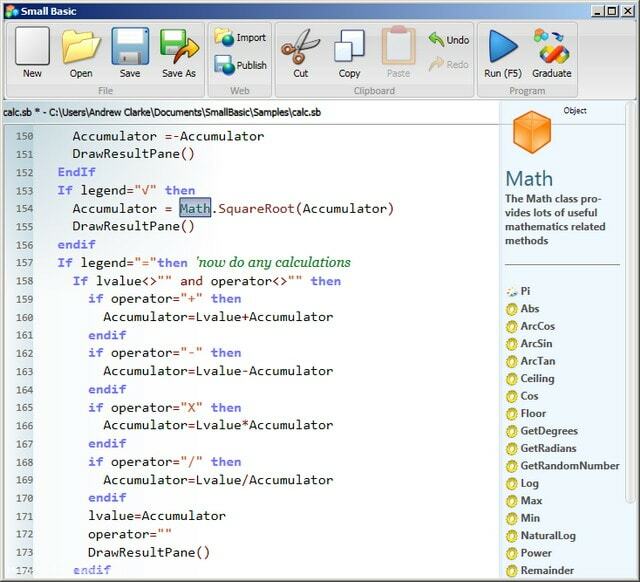 For example, it allows you to use all .Net Types, Subs and Functions in Small Basic, as well as events. It add events on controls such as buttons or textboxes, and on shapes such as ellipses and polygons. It allows you to consume XML documents, and provides a number of other useful features. This is essential in the early stages of learning the language. The intellisense is good but nothing beats seeing the entire list of what is available. This is probably the best place to pick up tips. It is very well supported by Vijaye, George Birbilis, Grzegorz Tworek and Francois Remy and a host of others. There is even a MySQL Database Access system in there! The place to start, as Vijaye does all the product announcements here, and filters out the best of the forum entries and presents them nicely. Gems include the ‘ Small Basic Programs in 25 lines competition. More useful resources in the Wiki that aren’t available anywhere else. 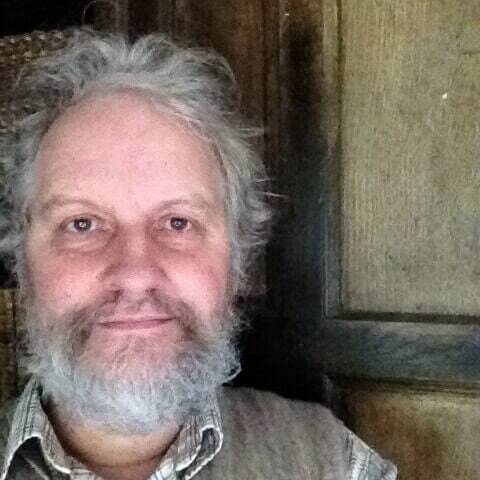 Andrew Clarke has been developing software applications for over 35 years. He is a database expert, but also has had many years of experience in designing and programming applications and software tools. He has a particular interest in website-publishing and ECommerce. Before joining Redgate, he worked with the first two winners of the 'Apprentice' program at Amstrad, creating various business applications, He is the editor of Simple-Talk. Fascinating walk-thru, Andrew. I was particularly grabbed by the observation about kids not programming for fun any more. I was 12 in 1984, when we got our first home computer (an Acorn Electron) and it’s fair to say that more than anything else, it drove me into this career. My eldest son will be 12 this year, and showing similar interests to me. I’ve scratched that particular itch for him with Lego Mindstorms (https://www.lego.com/en-us/mindstorms/) – programming but with really cool hardware – and although it’s not cheap, I’d really encourage other parents to look into it. But I’ll definitely point him at Small Basic too. I grew up writing small programs with the TRS-80 and Atari 800, so I understand what this is aiming for. But I think I’d rather have my kids cut their programming teeth on a language that reinforces good techniques. Not one that requires global variables, no parameters for your subroutines, and no functions with return values. If it’s not going to be object-oriented it could at least be a good structured language. I believe if anything, it may serve to grab the attention of to-be programmers, particularly young kids. I cut my teeth on VIC20 & ZX Spectrum BASIC, and it set my career course. While I agree that in a perfect world everyone would start out on a more ‘structured’ language, and learn programming the ‘right way’, that task for most kids is so daunting it is more likely to discourage than encourage. It would only take a few ‘fun apps’ to realize that hey, this Small BASIC is pretty neat, what if I want to do more powerful stuff? Then the world of programming is opened up. Fixed. The CMS removed the link entirely! On the subject of the complaint that the language has only global variables and cannot pass parameters to subroutines, there are plenty of alternative languages that take the approach you suggest. Vijaye is far more concerned to reduce the time it takes a beginner to achieve something practical and rewarding. It is an unconventional approach but, when the programmer finds the restrictions unbearable, then there is always the ‘graduate’ button. If you feel strongly about it, why not implement a ‘graduate’ button to IronRuby or F#? I imagine that Vijaye would be delighted. A great walk through, sir. As one of those “old guys” that grew up with TS1000 Basic (no DATA statement!) I point to this now to re-capture programming for fun. Just wanted to thank you for a great article and top sample for a simple calculator. This sample is ideal for beginners as it shows how to set up a data table as an array and how to create a button without the limits of Control.AddButton. Often the question of how to colour buttons appears on the Small Basic forum.